You hear this all of the time. Students are supposed to recognize it, write about it, and talk about it. When it comes to incorporating it into their writing, things get a bit fuzzy. Students suddenly start to plagiarize, or they produce a long list of random information from a book or other source. This chart is my solution to that. I ask students not to quote any information directly. This eliminates giant passages of text from being copied and held together with a set of quotation marks. I ask students to just tell me what they text says in their own words (paraphrase) and then tell me why I should care. Why does this information matter? Who cares? Telling why the evidence matters is critical. This shifts the use of textual evidence away from listing and shows the thinking behind it. This is powerful and moves students closer to synthesis. Continue giving examples until students start sharing ideas that fit under the What does your source say? category. After a brief discussion, I began to create the chart and show how we tell readers what we learned from sources in the same way. Then, I begin adding the sticky notes. After they are all added, I go back to the original questions. 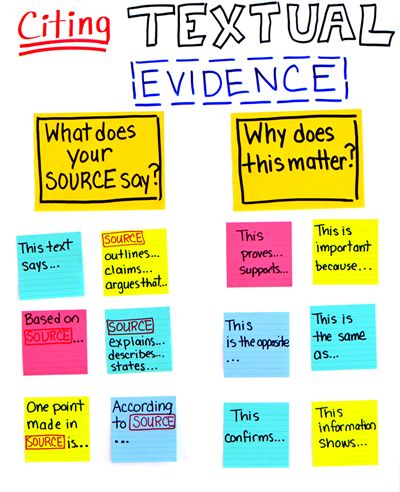 I ask students to tell me how they could begin a sentence to share evidence from a source. Then, I ask them to select a second sentence starter to help me understand why this matters. Why should I care? A fun way to practice this is to watch commercials and ask students to write two sentences to share what the commercial (source) says and a second sentence to show why this information matters. This is always fun and helps the learning to stick.